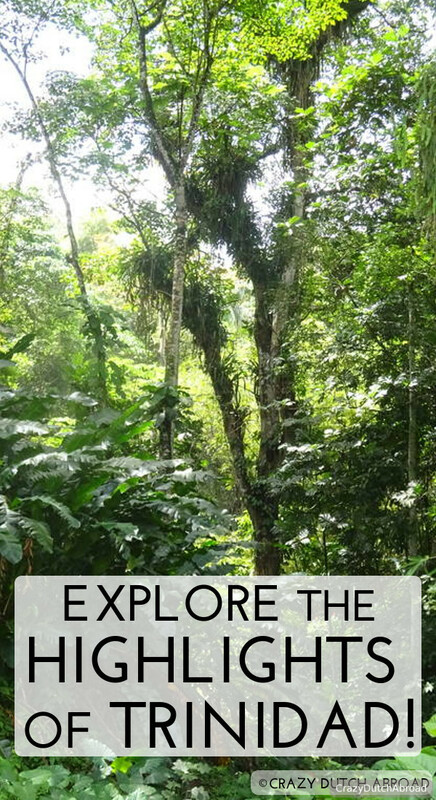 Explore the Highlights of Trinidad! Two Islands one nation, hello Trinidad and Tobago! Trinidad is the most Southern Island of the Caribbean. Get ready for rainforest, mountains and tropical birds! The land of the hummingbird and the birthplace of the steel pan drum. The republic of Trinidad and Tobago is an exotic twin island country close to Venezuela in the Caribbean. 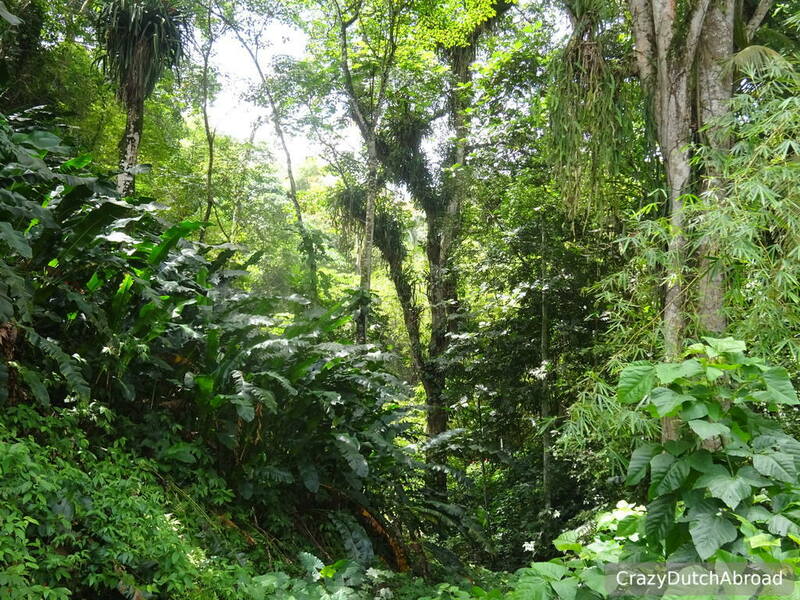 In contrast to Bonaire and Curaçao the islands have a tropical rainforest climate. 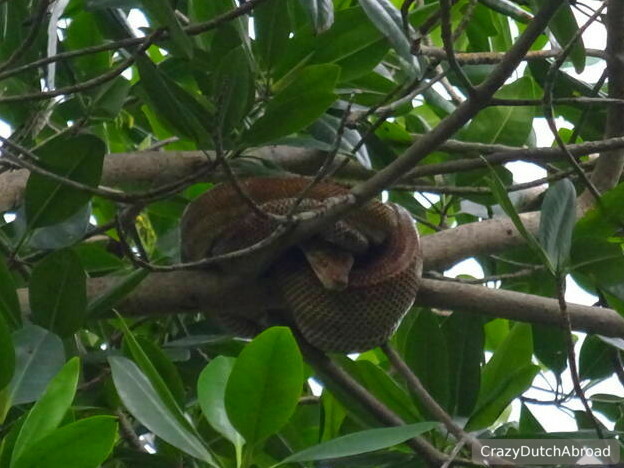 It is hot, humid and impressively green with hundreds of bird and butterfly species, monkeys and even caiman crocodiles. Both islands have beautiful bays with stunning beaches and palm trees while tourism is surprisingly low. On Trinidad (island) most business takes place, the production of oil and gas, but also a world famous spot for Carnival . Tobago (island) on the other hand is the more tropical escape where people go for a holiday and SCUBA diving. Things to love about Trinidad! 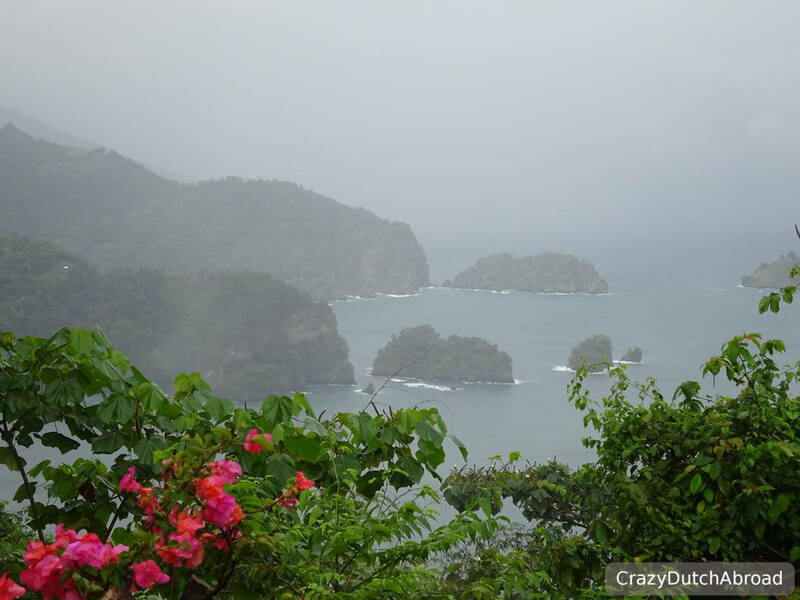 Road trip through the rainforest and along the coast line! 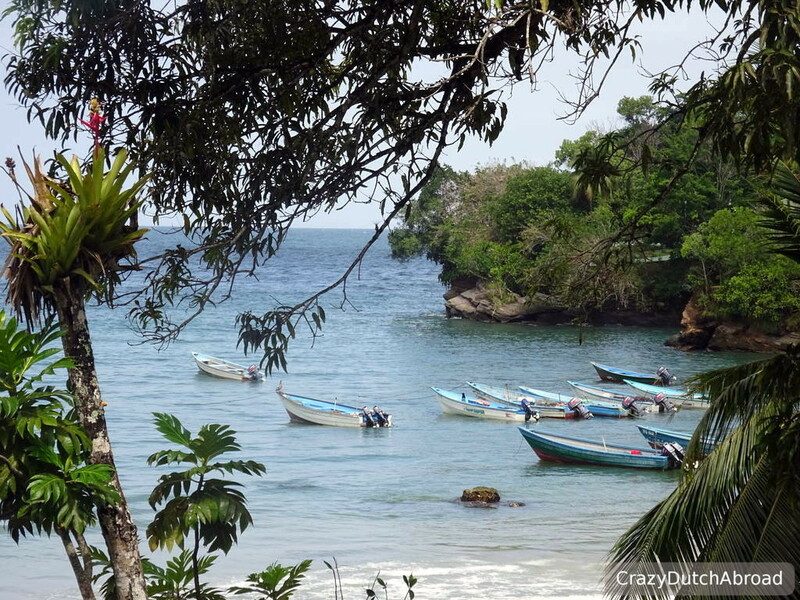 Las Cuevas Bay with fishing boats. Sharp turns and dangerous bends are part of this scenic route in the North-West of Trinidad. It is curly and narrow! 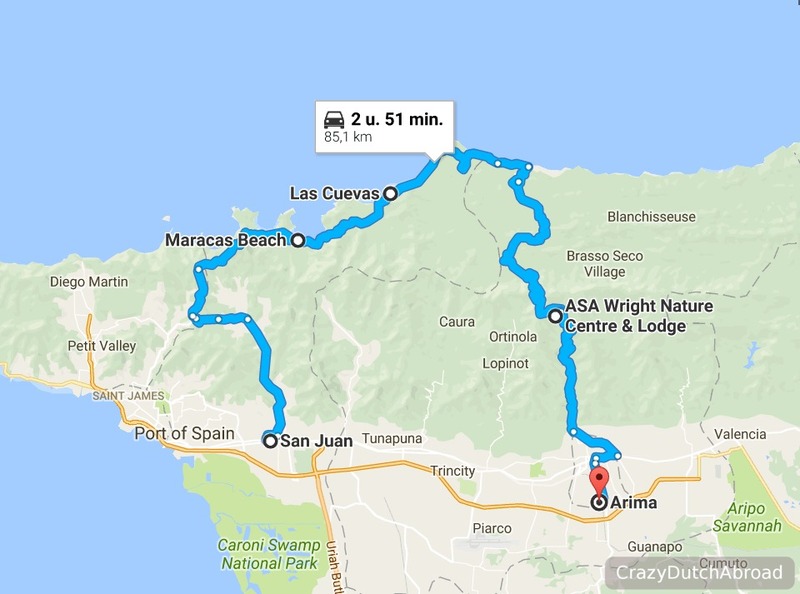 Starting from San Juan or Port of Spain you drive up North along the scenic Saddle road. 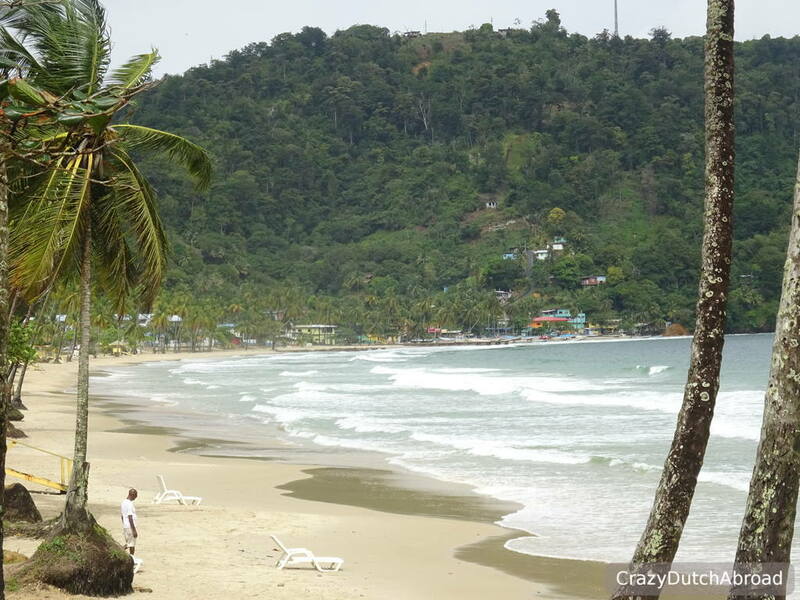 The Saddle road turns in to North Coast road which leads to the famous beaches of Maracas and Las Cuevas Bay. Relax on the beach, enjoy a fresh coconut or take a refreshing swim in the Caribbean Sea. Road map of the scenic trip. Continue on the North Coast road and before reaching the town center of Blanchisseuse (police station and church) turn in to Blanchisseuse Road to go South. 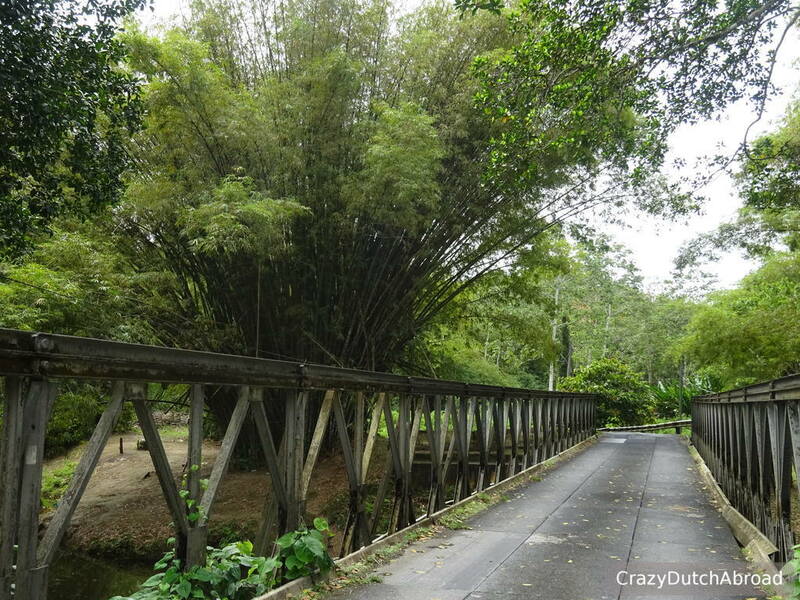 This is the road back to Arima where you pass by ASA Wright Nature Centre, see below, a lovely curly jungle road with scenic views and some small villages. Make sure to download the map before you go. Google Maps is not accurate here, many turns and curves are not on it, but it works pretty good. Without stops it took us about 4,5 hours which you could do in less than 3, I wonder how people do this with all the holes and bumps in the road but good luck! More information about car rentals you can find in the facts sections below. Waiting for the Leatherback sea turtles on the beach! 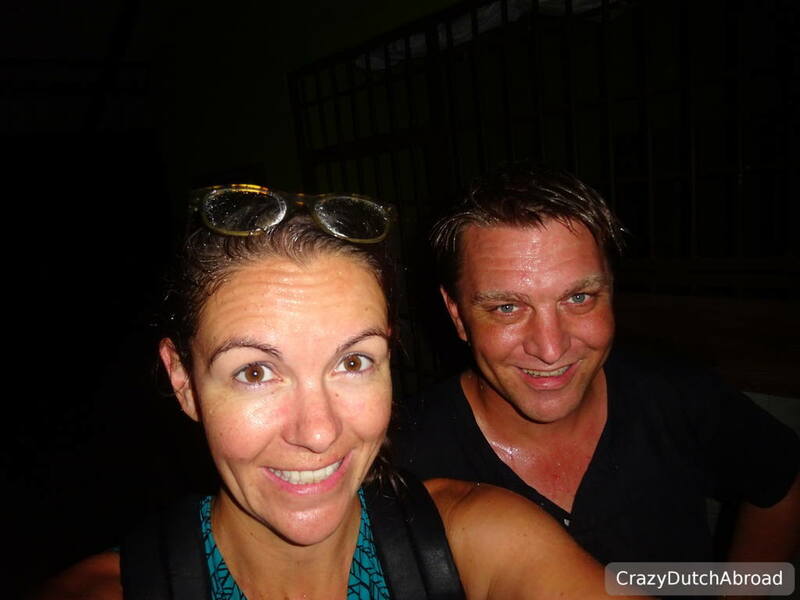 Soaking wet while waiting for the Leatherback turtles in the dark. This is one the highlights of Trinidad! From May to August you can experience the Leatherback and other sea turtles nesting activities. They come ashore to dig a hole in the sand and lay there eggs, two months later the tiny baby turtles crawl out of the sand back to the sea (hatching). 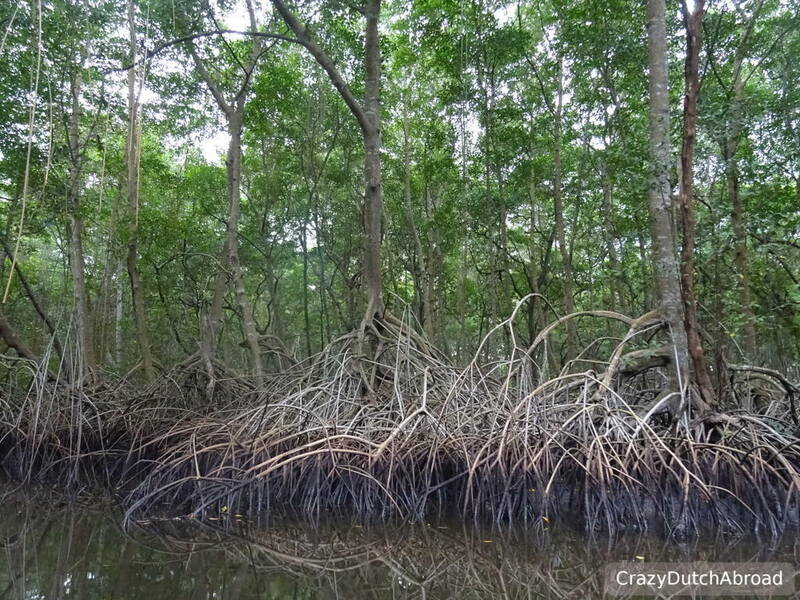 This is a unique experience with endangered turtles that can grow as tall as a human being! As the season slowly starts the turtles are not around in big numbers at the beginning of March. It takes a few weeks before it gets really interesting for visitors and from June onward you can experience both the nesting and the hatching. It was hard to get the right practical information about watching the Leatherback sea turtles. With the information on The Turtle Village Trust website I called the Forestry division in Sangre Grande (the rest did not answer). They advised us just to go to one of the nesting beaches and arrange things from there. We thought Grand Riviere would be the best spot since the area is smaller than Matura but it is quite a long and curly drive in the dark. We ended up driving past Nature Seekers office in Mature where there were accidentally people around. They told us we could join the volunteers at 7 PM and the changes of seeing Leatherbacks would be similar, saving a long drive. We thought we should give it a try anyway. The remote road to the beach was dark and there was nobody around other than the volunteers arriving for their first night of guarding the turtles and nests. One of the volunteers explained us passionately all about these magnificent turtles and their nesting behaviour. Since light can disturb the turtles we were waiting on the beach in complete darkness, only with a tiny red light for navigation. All volunteers walked to a specific section of the beach to monitor any activity. It is so exciting to wait and watch the shoreline for a huge prehistoric creature to slowly crawl out of the water. Try some delicious Trinidian food! With a mixture of African, Indian, Creole, South American and many other influences the Trinidadian cuisine is a little bit of everything - with a lot of spices. Small roti shops and hawker stalls selling Doubles are all around. 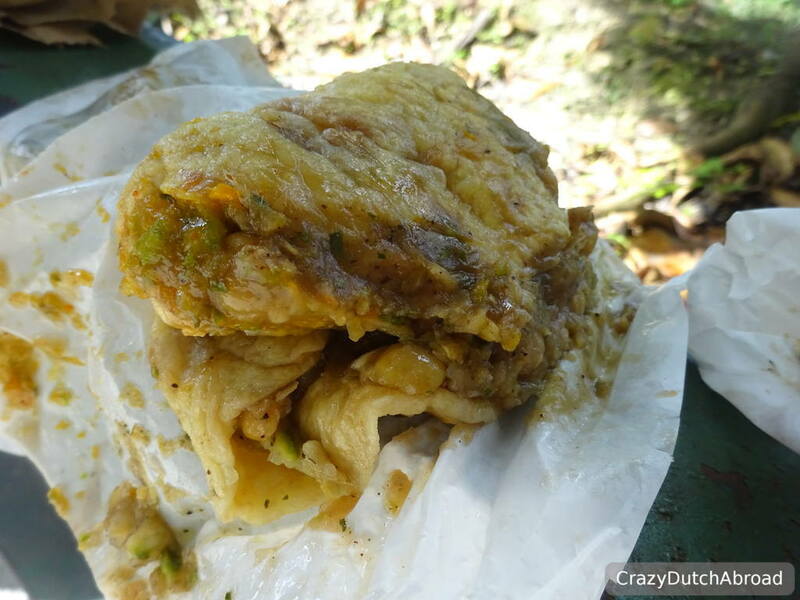 Doubles is a local dish which is often consumed for breakfast. It looks a bit like a pancake with a chickpeas paste and comes with a lot of pepper. Not the healthiest breakfast but very tasty and it tastes better than it looks, try it! 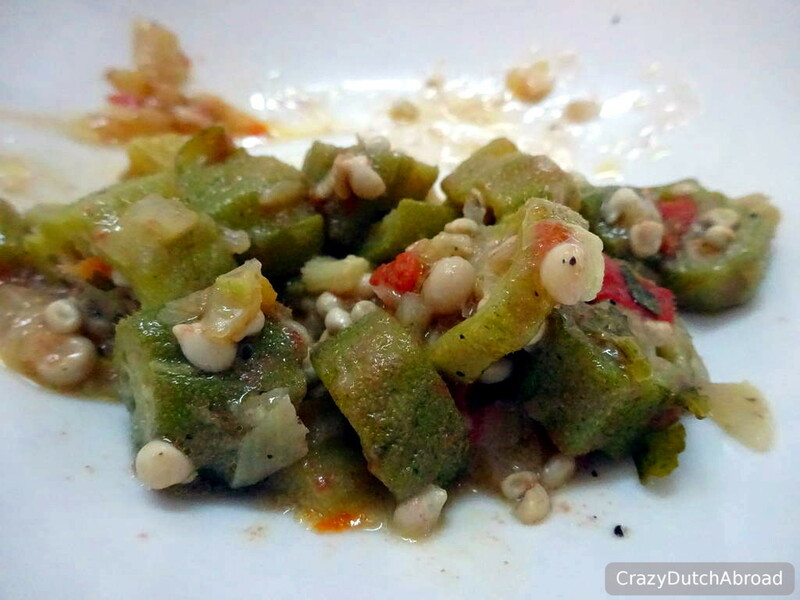 Another breakfast you should try is sada with plantains and ochroes (okra), see pictures below. Pelau is a popular lunch dish, something like fried rice and beans with boneless chicken or beef, often accompanied with salad. Callaloo is one of my favourite Trinidian foods, a green cooked vegetable that looks like spinach. Forget about pronouncing it the right way - laughs guaranteed! If you like sweets, try coconut bake or buns. 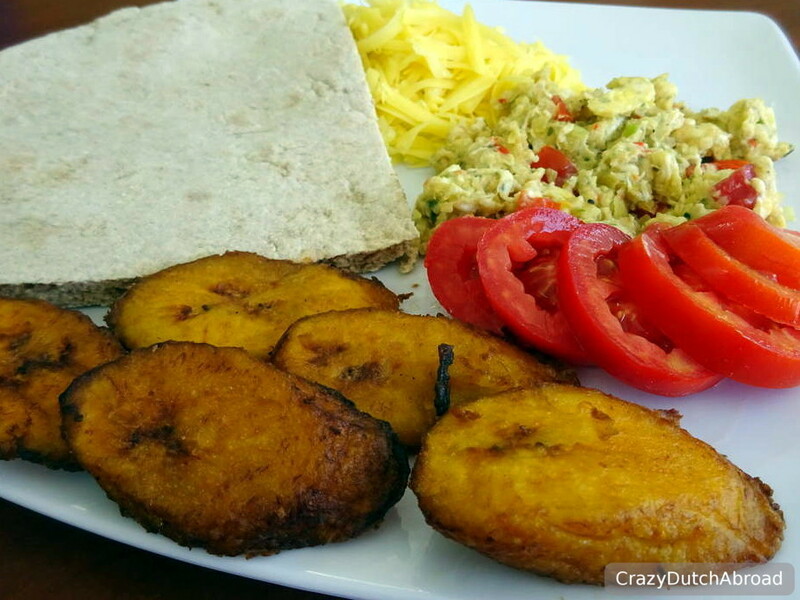 Doubles, ochroes and sada with plantains. Swamp boat tour to spot scarlet ibis birds! 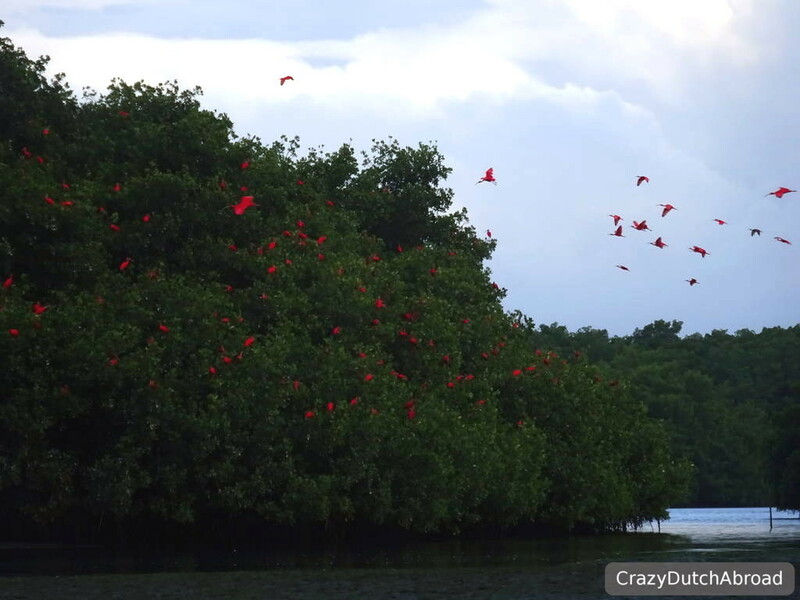 If you think watching flamingos is impressive, go and spot scarlet ibis (Eudocimus ruber) in Trinidad! 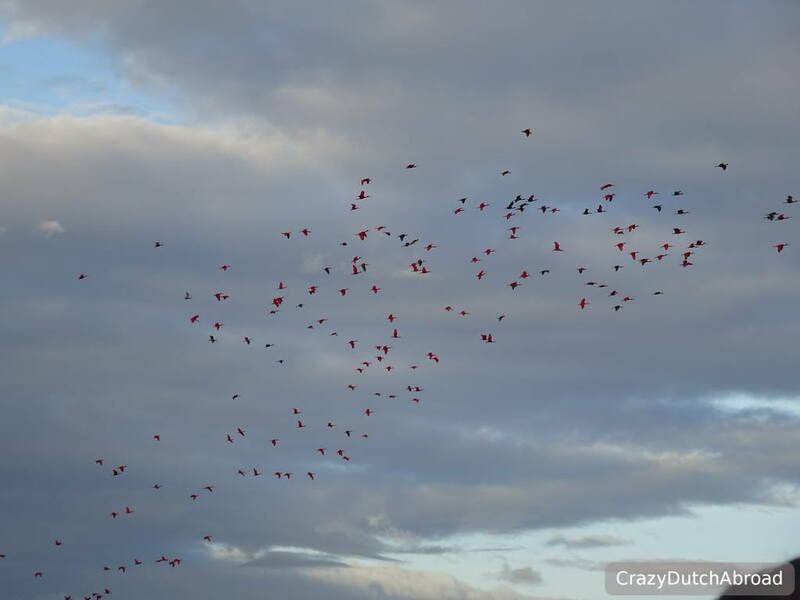 Their color is so bright red it is incredible to watch those birds in the sky and tries. 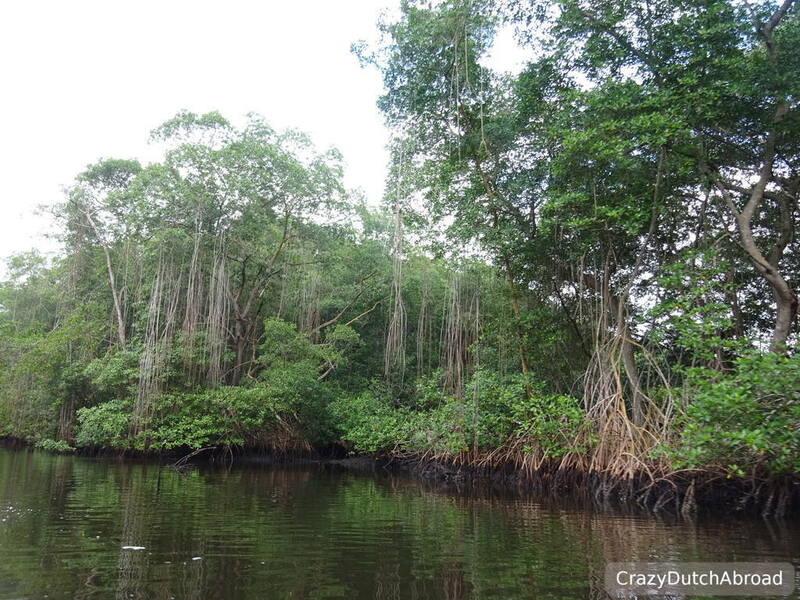 In the Caroni Swamp National Park you can watch them 'come home' and find a place to rest in the mangrove trees in the late afternoon. There are various tour operators organizing boat tours of about 2,5 hours. There is also a small visitors center where you can check-out the animals around. We went with Nanan's Caroni Bird Sanctuary Tours, leaving at 4 PM in a boat with about 40 other people and a knowledgeable guide/boatman. Slowly we crossed a path through the mangrove forest seeing snakes, owls, blue heron birds and various crab species before the boat stopped at the big lake to watch hundreds of scarlet ibis birds. Beautiful! As tourism is not a major income source of the country do not expect things to run smoothly if you organize trips yourself. Websites are often outdated, time schedule inaccurate and forget about emailing companies - they just do not answer (apart from the companies that are managed by foreigners). Even Carnival websites and official tourism board websites do not seem to be accurate. Calling is your best bet to get the right information, if your call is answered off course. It might be worth getting a local SIM card with a small prepaid bundle just to get yourself organized, call a taxi, etc. Although everybody tries to help out, giving you the best information they have - often we found out it is not the right information. Call the companies you need directly and keep trying! Some people have WhatsApp but they do not seem to call with it. Quite a few locals we met use it as a voice-mail messenger, recording their message before sending it. The language is difficult to understand! While English is the official language of Trindidad and Tobago it can be really hard to understand what people are saying. It sounds like a strong dialect with some strange words in it. Often we had to ask things three times before we understood and the other way around, hilarious sometimes. Although Trinidad was a Spanish colony in the old days, do not pronounce words in Spanish. Like the city San Juan, Trinidians say Sawa but if your say 'sour' they understand it perfectly. After our long and beautiful scenic route mentioned above we arrived at the ASA Wright Nature Centre & Lodge. We expected a nature center will all kinds of information and presentations. Something like a visitors center plus guided tours. There are two guided tours daily but there is no visitors center or unguided information. Port of Spain, capital of Trinidad and Tobago. As we were tired of driving we wanted to buy a cup of coffee first and figure out if we could fit the guided tour in our schedule, which lasts one and a half hour. We could not buy a cup of coffee as the restaurant was behind the entrance. 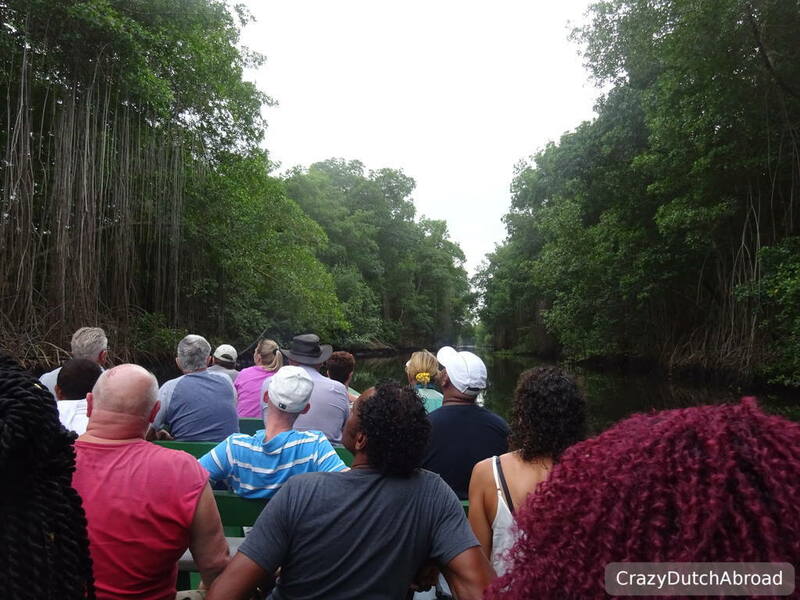 We decided to skip it as we already saw incredibly beautiful birds and other animals along our scenic drive and we wanted to make it to the Caroni swap in time for the boat tour. Luckily we did that because we would have never been on time due to traffic. 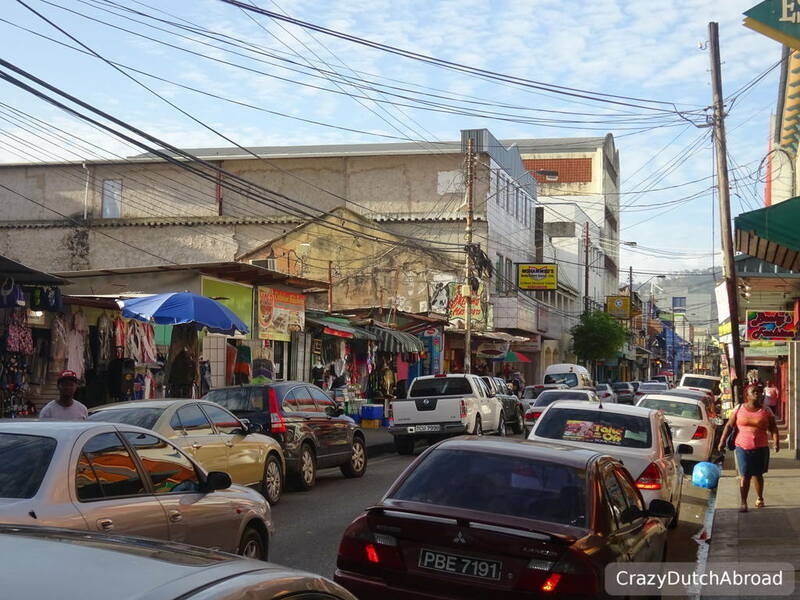 San Fernando is the second largest city on Trinidad and about one hour away from Port of Spain. Just like Port of Spain the city seemed very local with less attractions. A few churches and some interesting buildings and viewpoints but no major highlights to our concern. It is possible to take a water taxi from Port of Spain, that should be nice. Especially the Blue Basin with crystal clear pools must be a beautiful place to visit. There are many cascades hidden in the rainforest on Trinidad, often you need to hike and climb before you can have a refreshing swim. There are kayak tours offered as well, check the Nature Seekers website for more information (and CALL for more information). Strip with bars Not really around. Movie Towne is the most dense area with bars and restaurants I guess, otherwise Ariapita Ave and Cipriani Blvd all in Port of Spain. Spots we loved Movie Towne: Trader Jack's Island Grill, Ariapita Ave: Hakka & More Vino and Cipriani Blvd: Jenny's On The Boulevard & Town Restaurant and Bar. Restaurants open Local restaurants often close around 5 PM, international restaurants are open from breakfast to late. Quality of local food Good but often greasy and/or deep fried. Scooter/car rental Scooters or bicycles are not around. We rented a new car with Hertz from the airport, about 30 USD per day. Local transport The maxi taxi costs 1 or 2 USD for about half an hour. Taxi Taxi costs 40 USD from Diego Martin to the Ferry terminal in Port of Spain. Apartment We stayed in Diego Martin through Airbnb. Click here to check the apartment & availability. Nice hotel Caribbean Villas offers self-catering rooms with shared bathroom for 40 USD a night. Local SIM card We did not buy a local SIM as free WIFI was widely available. It would have been useful for all the local calls for information! WIFI Hot spot Free WIFI is offered at restaurants and bars around the island. The speed is fine, depending on the number of users of course. The maxi taxi is an official way of public transportation, any licence plate starting with a H. Still it seems like there is a competition between the drivers in getting more customers. The maxi costs 1 or 2 USD for about half an hour. If you are tall - like the Dutch - you might have a hard time with finding leg space. We even used it for transportation with all our luggage, than you just pay for the extra seats your luggage is taking. 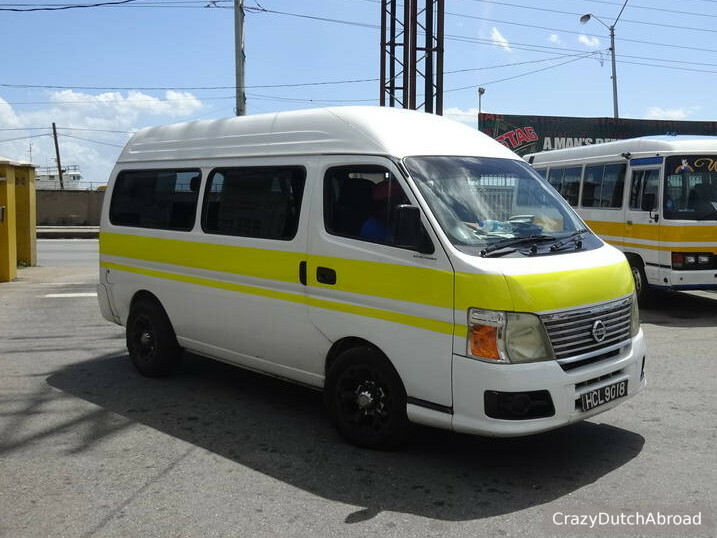 Maxi taxi in Port of Spain, the yellow line to Petit Valley/Diego Martin.